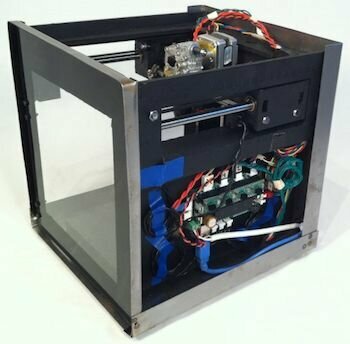 Solidoodle: A fully-assembled 3D printer for $699! As a technology develops and becomes popularized, the prices of the technology comes down — faster and faster. We’ve seen it many times and now we are watching the same thing happening with 3D printers. It’s occurring in both in the expensive (well, not that expensive any longer) commercial systems, office desktop systems and hobbyist printers. But it’s accelerating even faster than I thought: a new 3D printer just broke an important psychological barrier. 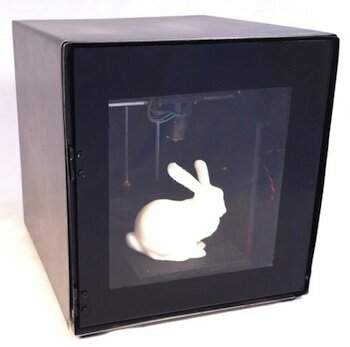 Brooklyn startup Solidoodle has recently introduced their Solidoodle 3D printer…for under $1,000. What’s that, you say you’ve seen some others under that price? Maybe, but not fully assembled! And not only is it under $1,000, it’s being sold at an “introductory price” of only $699. I believe that makes it the first fully assembled 3D printer under $1,000. Impressive. In fact, since I’m both cheap and not good with tools, I might even take the plunge and buy one myself. The metal-enclosed design is nice to see for a change on a hobbyist machine. It looks very professional, certainly not like something you might have built yourself. And that under 10 x 10 x 10 inch exterior dimension sure doesn’t take up much space. Not much bigger than a hefty 4-slice toaster, you could even keep this on your kitchen counter. Their website has a guide on installing the software on Windows. Instructions for Mac and Linux are coming. You’ll be installing drivers for the Arduino electronics, Python, Skeinforge and Pronterface. Python is the programming environment for Skienforge and Pronterface. Want one? Go to the Solidoodle sales page. But hurry up and get in line; only 20 are being produced in the first production run.